Who can apply to join our day opportunities? Adults (aged 18+) with low to moderate learning disabilities, or other needs, who are fully mobile and able to work in a public-facing commercial setting. Adults who may find themselves isolated or vulnerable by virtue of their circumstances who wish for a sympathetic workplace where they can gradually develop their skills. Due to the public-facing nature of our work in the workshops, adults who have a history of high levels of challenging behaviour are unlikely to find this a suitable placement. Camphill Holywood can uniquely offer each individual the choice to participate in one of four different workshops, depending on their skills, what they would like to do and what their future aims are. After an initial assessment, a tailored programme of development will be offered to every individual. Activities are person-centred, holistic and adapted to each person's level of competence. The bakery workshop is particularly suitable for adults who wish to learn in a slower-paced, calm, environment which is not facing. The holistic, therapeutic environment allows adults to take their time to develop practical skills and find their work life rhythm through tasks such as rolling dough, mixing ingredients, weighing and measuring. You can also develop awareness of food hygiene and safe food practices. a competent and relevant skill set. You can participate in preparing, cooking and serving the meals. By working in our café you can learn to create healthy, nourishing vegetarian dishes, skills that you can take with you for life! The shop is front-facing and quicker paced. Adults can engage in customer service and hospitality. In this retail environment duties include stock rotation, cash handling, answering the telephone, receiving and checking deliveries. Retail skills are needed in many work places. 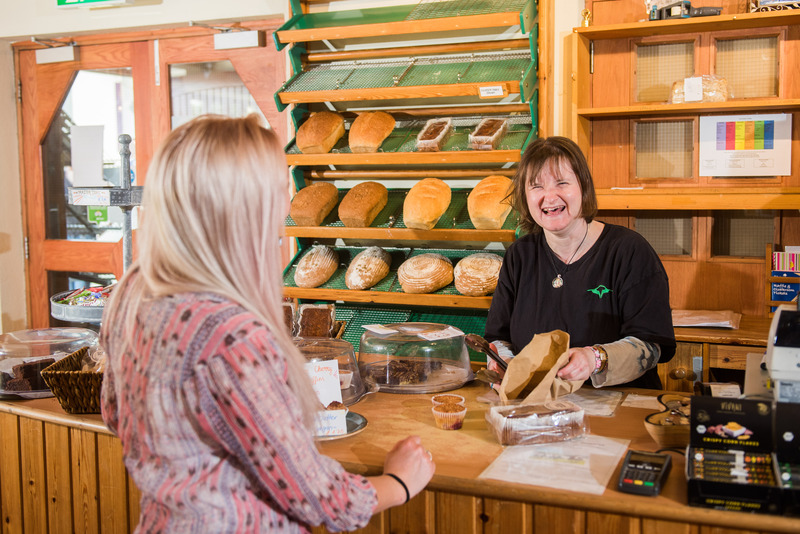 The skills you can develop in Camphill Holywood such as communication, time management, problem solving and customer service can be transferred to many other working environments. We believe that a healthy cultural and artistic life is important. To grow, each person should have the opportunity to develop and nourish their talents. By joining us you can try out creative tasks such as origami, bag painting, sewing, printing and packaging and many more!